When I was working at JPMorgan Asset Management several years ago, I once ran into LL Cool J in the elevator. He was at the bank because he was one of our clients. Running into a celebrity at my job had me on cloud 9 for about a month (and what female wouldn’t be after running into LL)! But, my interaction with LL left a lasting impression on me. I realized that when it comes to managing money, wealthy people get a financial advisor to help themselves become more wealthy. We should all follow their lead! How exactly do we follow their lead? Well, for starters you need to consider getting a financial advisor to help you manage your own money and grow your wealth. I know it can be overwhelming trying to find a financial advisor when you are not familiar with what they do and what makes one more qualified than another. And, I bet it’s not at the top of your “Fun” list. That is why I came up with the “Demystifying Financial Advisors” episode for the Charisse Says show, which is the second episode of the series I’m rebroadcasting with Modest Money. What types of financial advisors are available to you? 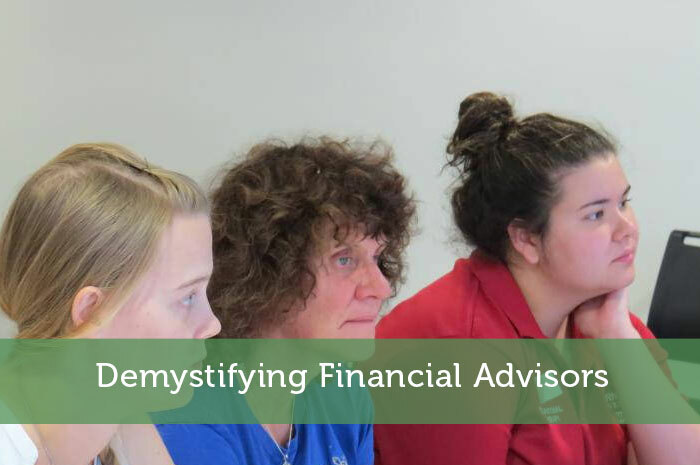 When you are researching different advisors, it is important to make sure the financial advisor has a credential behind their name. One of the most common credentials is a Certified Financial Planner or CFP. CFPs deal with everything from budgeting to estate planning to managing your investments. A CFP went through a rigorous 10-hour exam, passed the CFP’s Board of Ethical standards, and is required to have several years of work experience. A CFP is the best credential for all around planning. Another designation is the CFA – Chartered Financial Analyst. The CFA charter has become the most respected and recognized investment designation in the world. They are your investment gurus. Notice that I did not mention CPA – Certified Public Accountant. In my video I explain why, and when it is OK for your financial planner to have a CPA credential. How much will a financial advisor cost? Some financial planners charge commissions, some are fee-only, and others charge a fee by the hour, like most lawyers. It is very important to pay attention to the way that your financial advisor is paid. For example, I personally do not like commission-based financial advisors because their incentives are aligned with the product that they are selling and not necessarily your best interests. Commission-based planners can also be a little aggressive, and usually work at insurance or mutual fund companies, so please BEWARE. Fee-only financial advisors charge a flat fee, such as $1,000 or $1,500 (which is typical for a comprehensive financial plan). Or, they might charge an annual fee, often 1% per year, of all of the assets—investment, retirement, college-savings and other accounts—that they are managing for you. When considering a financial advisor, view the fees as part of the service – just like any other service you buy. If you think that you do not want to spend the extra money or can’t afford to pay these fees because they’re too high, think again. You get what you pay for. I am a big proponent of paying up for quality and service. Still have questions? Watch this short, entertaining, and practical video and you will understand what financial advisors are, how much they cost, and what kind of financial advisors you should look for to get your money on track.